Grand Rapids melodic post-rock quintet All Is Well use their first full-length LP to explore the depths of mental health issues, reaching beyond the genre’s tendencies and exploring a vast sonic landscape that’s quite impressive especially for a first album. I Swear Someday was written at a time of transition for the members of the band as they went through a myriad of difficult life events. By drawing from personal experiences and diving into the implications of dealing with these thoughts and feelings, All Is Well crafts an album that is not only relatable but one that stays with you long after you’ve finished listening to it. There was an air of familiarity to I Swear Someday on my first listen through, like meeting someone for the first time but feeling like you’ve been friends forever. This might be because All Is Well’s sounds calls to mind early From Indian Lakes mixed with Minus the Bear and just a dash of Incubus. Typically it takes me multiple listens before I form an emotional connection with a song or album but I Swear Someday had me hooked as soon as the intro for the first track started coming through my headphones. The opening exchange on “As I Lie Myself to Sleep” between the guitars and keyboard gives the track a sci-fi feel, drawing the listener in so that they’re completely entranced by the time the opening verse starts. “Midnight again / Back out of bed / I can feel my voice burning through my head / I can hear the words telling me / I’m never giving my best / I can’t fall asleep at all.” Having suffered from both depression and insomnia, this is a feeling I can relate to all too well. The track pulls back on the verses allowing the lyrics to stand out nicely before building to a loud, almost manic chorus much like the way depression does to your thoughts and emotions. While the first half of I Swear Someday skews darker, the aptly titled “Light” breaks things up nicely at the half way point of the album. The intro reminds me a bit of some wonderful 8-bit rock akin to I Fight Dragons. The ethereal airy sounds compliment the lyrics nicely. “I’m here for the better days / Hearts open and wide awake / We’ll rise up from that bitter grave / Light.” If you’ve struggled with mental health, it’s easy to relate to this hopeful tune that promises light at the end of the tunnel. All Is Well craft a refreshing album that manages to be emotionally honest and raw throughout it’s entirety. While the feeling of truly knowing I Swear Someday before I finished listening to it for the first time pulled me in, the candor of the lyrics mixed with the wonderful textures of the music is what kept me coming back for more. I always seek out things that I can relate to when I find myself struggling. Something that shows me others have been where I have and have felt what I’m feeling. It’s what keeps me going when I’m in my darkest places because, for me, it proves that I’m not alone and that I can pull out of it. It’s great knowing I have another album in I Swear Someday that will make dealing with those dark thoughts and suffocating feelings a little easier. You can stream I Swear Someday on Spotify or pick up a copy on Amazon, Bandcamp, Google, or iTunes. 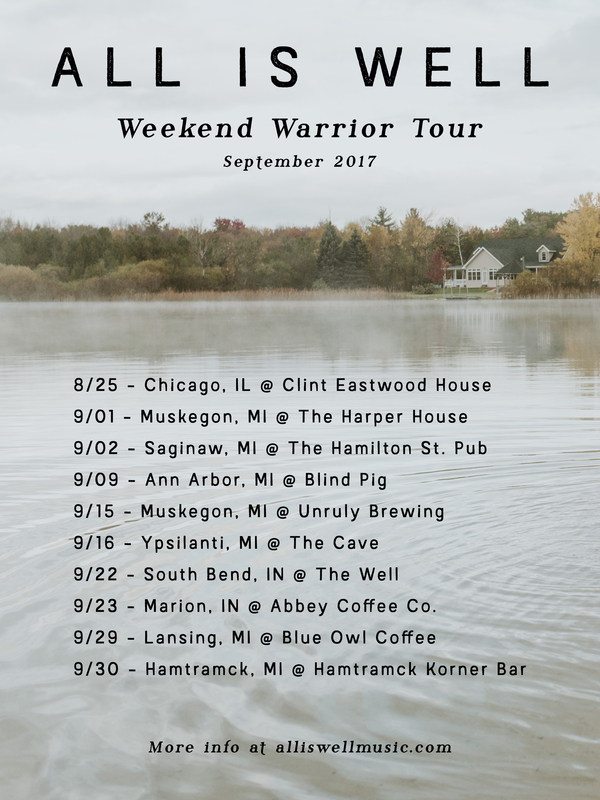 Make sure to check out All Is Well on their Weekend Warrior Tour this fall.